The majority of the larger foraminifera derive from the foraminiferal suborder Allogromiina and are themselves divided into six suborders. These are differentiated from one another by the structure of the walls of their tests and other internal features. The major suborders of the larger foraminifera will be discussed in the Benthic Foraminifera page below and include the following; Fusulinina, Lagenina, Involutinina, Miliolina, Textulariina, and Rotaliina. The relationship of foraminifera to other eukaryotes remains unclear. Baldouf (2003) noted that forams should be placed in the "Cercozoa" group as cercoazoans are amoebae, with filose pseudopodia, living within elaborate hard shells. 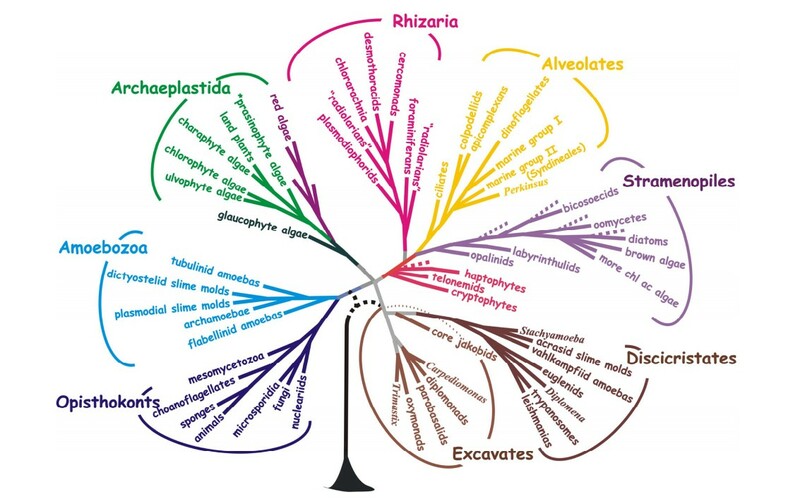 Ribosomal RNA gene trees have suggested that forams are closely related to slime moulds and amoebae (Pawlowski et al., 1994). The research of Archibald et al. (2003) indicated that cercozoan and foraminiferan genes contain a shared derived character, implying foraminifera and cercozoa share a common ancestor. Even now, the evolution of this group of single-celled organisms is still being deciphered and additional protein data and studies are necessary to pinpoint their phylogeny. Of the approximately 4000 living species of foraminifera the life cycles of only 20 or so are known. There are a great variety of reproductive, growth and feeding strategies. Foraminifera may reproduce asexually by binary fission or may also reproduce sexually, producing many hundreds of offspring. The growth rate of the calcareous shells of foraminifera is light-dependent (Rottger, 1983). 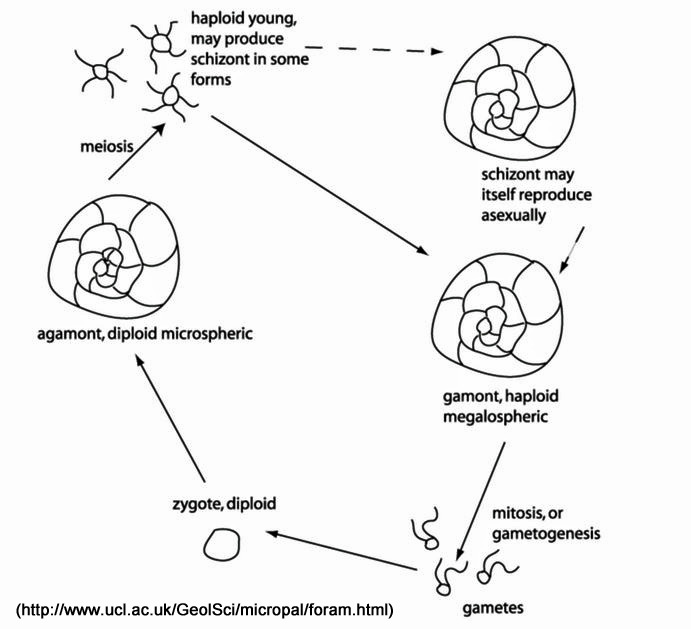 Larger forams alternate generations between a haploid, uninucleate gamont (sexual generation which produces gametes) and a diploid, multinucleate agamont (asexual generation producing daughter individuals through fission). An asexually produced haploid generation commonly form a large proloculus (first chamber) and are therefore termed megalospheric. Sexually produced diploid generations tend to produce a smaller proloculus and are termed microspheric. Many foraminiferal tests are either partially dissolved or disintegrated during the reproductive process as is evidenced in the fossil record. Foraminifera utilize a huge variety of feeding mechanisms, as evidenced by the great variety of test morphologies that they exhibit. Some forams absorb dissolved organic matter via a "root" system while others depend on the substrate in which they live.Some foraminifera are omnivorous opportunistic feeders that consume autotrophic and heterotrophic protists (including other foraminifera), metazoans and detritus. Some suspension feeding foraminifera utilize their pseudopodia to capture food from the water column. Benthic and planktonic foraminifera that inhabit the photic zone often live symbiotically with photosynthesising algae. Foraminifera are preyed upon by many organisms including worms, crustacea, gastropods, echinoderms and even fish.